Alaska Governor Bill Walker/VimeoGovernor Bill Walker was the first to reduce Alaska’s universal basic income program, which was a highly unpopular move. The Alaska Permanent Fund is tied to oil revenues and worth $US65 billion. It has made an annual check of $US1,000 to $US2,000 available to virtually every citizen since 1982. The fear that giving people regular, no-strings-attached payments might discourage them from working is common among opponents of similar programs. But research from a University of Chicago professor and University of Pennsylvania professor found that this universal basic income program increases part-time employment, creating a neutral effect on employment numbers. 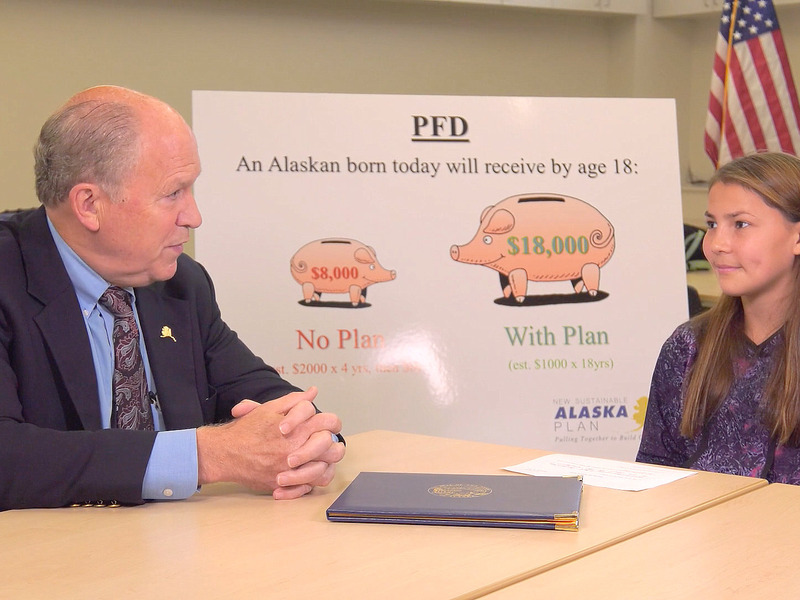 The Alaska Permanent Fund Dividend is the only large-scale universal basic income program in the United States, and securing its long-term survival is a major issue in this year’s gubernatorial race. The vast majority of Alaska’s roughly 740,000 citizens support the dividend, which gives virtually every citizen an annual check of about $US1,000 to $US2,000 (that’s $US4,000 to $US8,000 for a family of four), and both political parties in the state are in favour. A year ahead of the Trans-Alaska Pipeline System’s completion in 1977, Republican governor Jay Hammond decided to constitutionally link at least 25% of the incoming oil money to a permanent fund, to ensure the young state’s long-term success. The state created the Alaska Permanent Fund Corporation a few years later to manage and grow this money, and in 1982, the state decided to begin distributing a portion of the fund’s annual earnings to any eligible person who applied for it. The fund today is worth around $US65 billion. Alaskans’ feelings about this universal cash transfer are supported by the findings of a working paper published in February that was written by University of Chicago Harris School of Public Policy professor Damon Jones and University of Pennsylvania School of Public Policy and Practice professor Ioana Marinescu – the annual dividend does not realise fears that such a program would lead people to quit their jobs, lowering employment. An additional $US8,000 for a family is certainly not going to replace a livable income, but, as Jones and Marinescu noted in their paper, studies around a cash assistance experiment in the 1970s, lottery winnings, and a permanent fund dividend for the Eastern Band of Cherokee Indians reduced earned income, and critics of any universal basic income programs have pointed to such findings as proof that anything on a larger scale would be a disaster. But Jones and Marinescu found instead that the larger scale of the program is what allows it to work, and not dissuade people out of the work force. More specifically, Jones and Marinescu determined that part-time employment increased by 17% only in the non-tradable sector (jobs whose output isn’t traded internationally), and that overall employment wasn’t affected because more spending money results in more demand, and thus more jobs. To use an illustrative but hypothetical example, someone who uses her dividend to help with car payments can cut back on her hours working as a cashier at a local grocery store. But because more people are spending more, the store will look to replace that worker who started working less. Meanwhile, the distribution of the dividend won’t affect the international demand for oil and the jobs connected to it. On that last point, it’s worth noting Alaska has the highest unemployment in America (around 7%), but that’s because of a state-wide recession that saw the loss of thousands of oil and construction jobs that have nothing to do with the dividend, which has long kept the state’s income inequality among the lowest in the country. Current governor Bill Walker cut the dividend the last few years to allocate more earnings to the state in response to the tough climate, making him the first governor to do so. This year’s check was for $US1,600, but the Associated Press reported it would have otherwise been $US2,980, a difference of $US5,520 for a family of four. The major unpopularity of the decision was one of the reasons why, in October, Walker stepped out of his bid for re-election. Alaskans of all walks of life and political leanings have fully integrated the dividend into their lives, and it’s worked for them. And while its universality results in an expectation that the government then has to manage, it is also why the program has no net effect on employment, which a more targeted cash transfer program could. A natural question then, is whether such a program could work in other parts of the US, or even the entire country. Jones told Business Insider that it’s important to understand that not only does Alaska have the benefit of massive oil reserves to fund its program, but it has chosen to allocate money away from other projects, such as infrastructure spending. The latter point is why the candidates for governor are now considering amendments to the state constitution that would protect the dividend and further define where the permanent fund’s earnings go. Jones said that he is interested in future research around the permanent fund in relation to how people spend their money after receiving it, but is confident that a universal basic income on the scale of Alaska’s would not have a negative impact on employment. “I think that it was very helpful to do this study to clear up some of my own thinking about it,” he said.